You’ll be led to your table through a series of “kitchens.” All of them are set up to resemble a 1950s dining space and are full of fun decor items that Disney imagineers have collected (garage sale, anyone?). 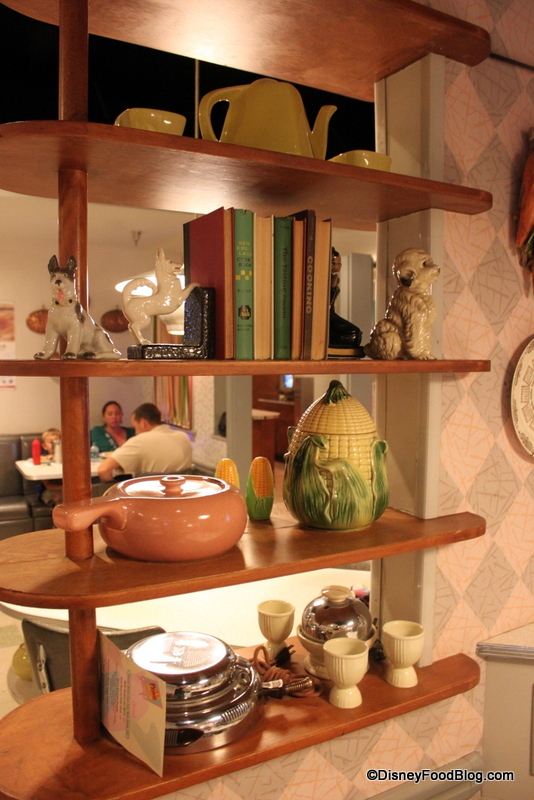 These kitschy shelves, full of knick knacks, serve as dividers throughout the kitchen spaces. Check out the awesome waffle iron and cloth-covered cord! Atmosphere - Recognize Anything From Your Grandparents' House? This is a terrific time to go over a few points just in case you are a 50s Prime Time Cafe newbie: First off, you can expect a healthy helping of witty banter from your server. They are instructed to give you a hard time, since you’re just kids eating at Mom’s table. 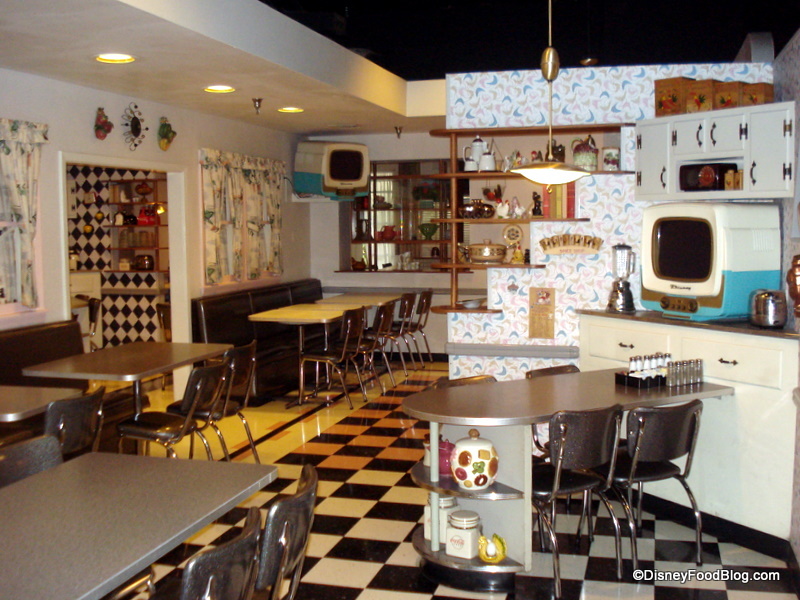 In fact, we gathered a few of our readers’ favorite 50’s Prime Time Cafe experiences here! Read through them to get a good idea of the types of things you might experience here. It’s all in good fun, though. If you don’t want to play along, just let your server know up front, and they’ll let you watch the fun rather than participate. Make sure to keep those elbows off the table! If you go to the bathroom, you had better be able to tell the color of the soap when you return. Eat all of your veggies. And what can you expect if you don’t “behave?” You might have to stand in the corner (we witnessed this one), or you might be made to sing “I’m a Little Teapot” in front of your fellow guests. And finish your veggies! My friend found out this one the hard way when she left two peas on her plate and our “cousin” Tommy picked up her fork and fed them to her! But we were on a quest to see what was new, so on to the food! The menu here is pretty small, featuring comfort foods with a couple of interesting options thrown in just for fun. Nothing too adventurous here, so picky eaters should be fine. To whet my whistle (whew! it was hot for October!) I started with Dad’s Electric Lemonade. Made with Bacardi rum, Skyy vodka, blue curacao, sweet and sour mix and Sprite, this sweet-tart treat hits the spot, and was actually the FIRST Dad’s Liquor Cabinet drink I ever ordered way back when. It was fun to try it again! And made with “Dad’s experimental electric ice cubes,” you get a special souvenir (yep — don’t forget to fish that thing out and take it with you)! The Fried Cheese is Back!! That’s right! The Fried Herb and Garlic Cheese is back in all its glory! 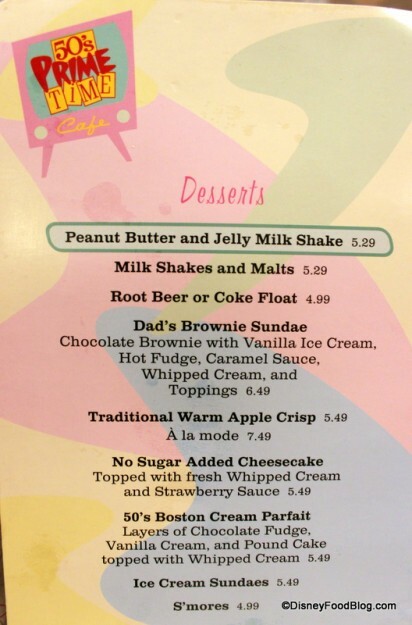 As long-time readers know, this WAS my #1 MOST-MISSED MENU ITEM on Disney property — you can even read all about it here on our Extinct Disney Foods post! 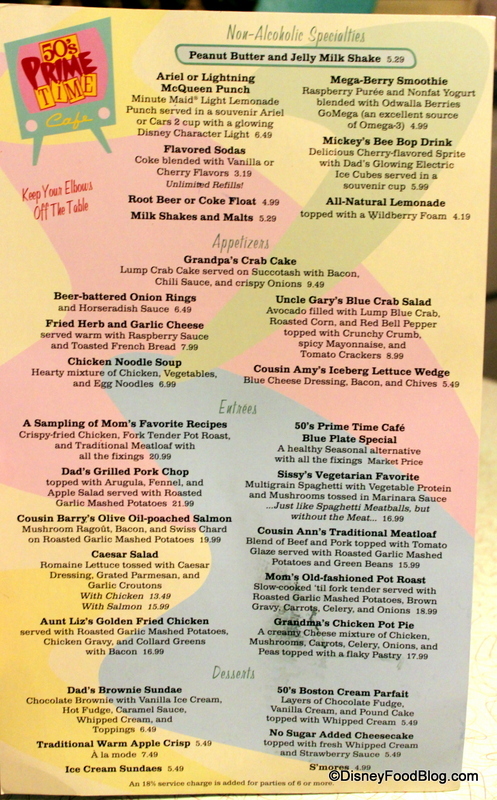 Hmm…the citrus swirl and fried herb cheese both came back this year…what else can we expect to be resurrected, Disney? I can’t wait to find out! It’s just as good as it was back then! Rich and flavorful with garlic and herbs, this is a fantastic start to a meal. And served with thinly sliced toast (though not enough), fruit, and a pool of raspberry sauce, we both loved this. Yay! My friend thought the Onion Rings sounded good, so we had an order of those to share as well. We loved the cute fry basket presentation! She really enjoyed the horseradish dipping sauce, which was creamy with just the right amount of zip. But while the plate, with its generous portions, was more than enough to share, I was a little disappointed with the selections. 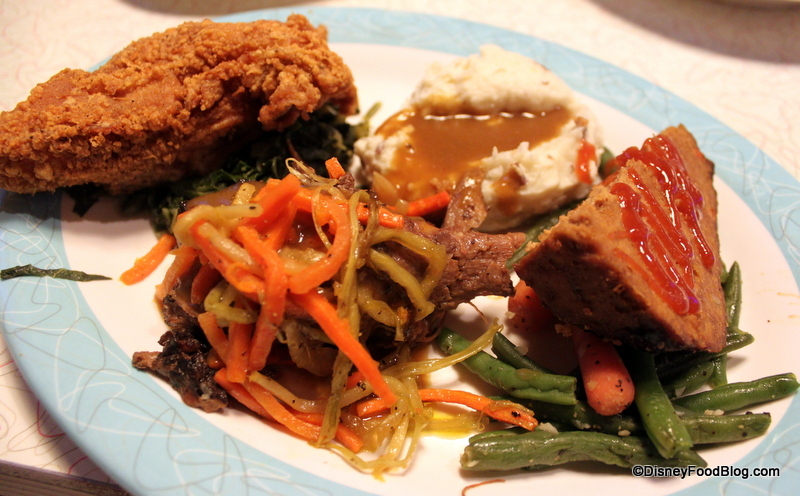 The meatloaf and fried chicken were a little dry (not the usual at 50s Prime Time). I wonder if it was because we were there very late at night. Overall, I think I’ll stick with the big ol’ plate of Aunt Liz’s Fried Chicken on my next visit! My friend opted for Grandma’s Chicken Pot Pie. She said it was perfectly adequate. The sauce was good, the puff pastry was fresh, and there were ample chunks of all the veggies from the menu (plus lots of chicken). If this is a favorite dish of yours, you’ll probably like it. Chocolate won out in both cases. First up — the classic 50s Prime Time S’mores dessert. 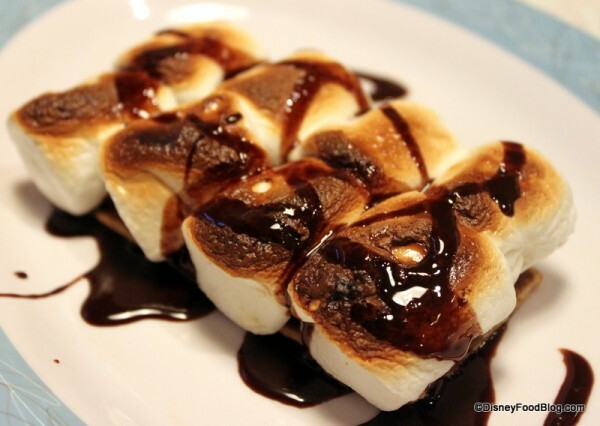 Made of a chocolate-coated graham cracker piled with torched, pillowy marshmallows and surrounded by chocolate sauce, this is exactly what you expect. Not terribly interesting, but if you find yourself in the middle of Disney, craving a s’more (and Fort Wilderness campfires aren’t an option) then give this a go. 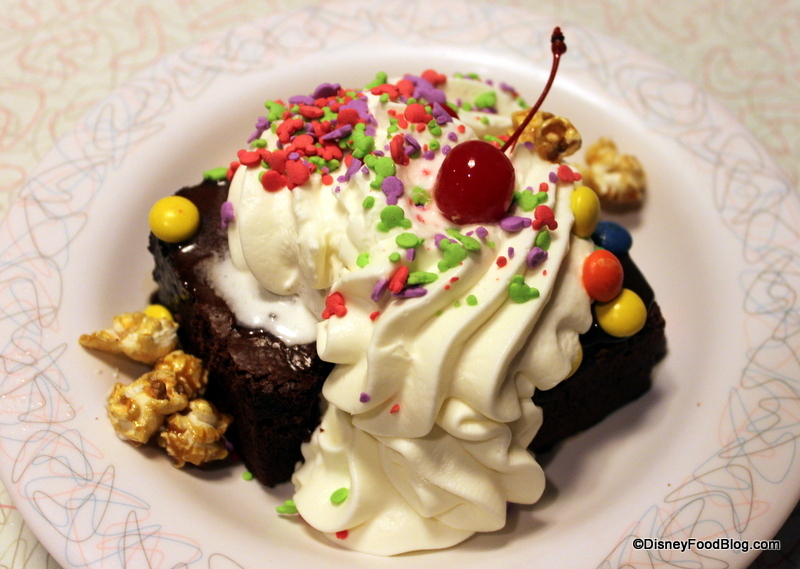 We also had Dad’s Brownie Sundae. Another Prime Time classic, this one had all kinds o’ garnish goin’ on — including caramel corn! But alas…the brownie lacked a little in the freshness department. Sure, if you’re just after something sweet and chocolatey and share-able, this is your go-to dessert. 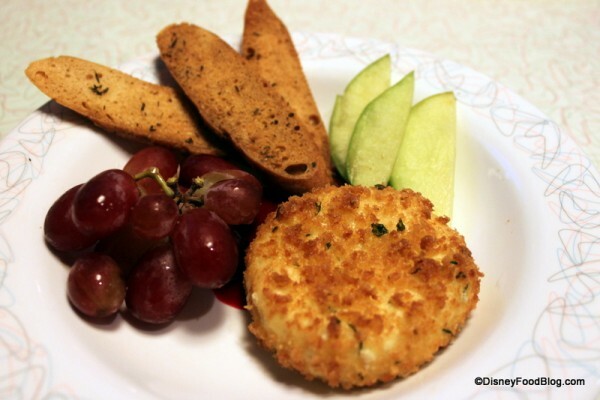 While our entrees and dessert didn’t super wow us, I am so so happy to see that fried cheese back on the menu! 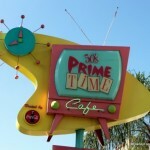 And a trip to 50s Prime Time Cafe is always a fun meal. The truth is, I’ve been here enough to know that this was an off night for the kitchen; my food is usually quite good here. 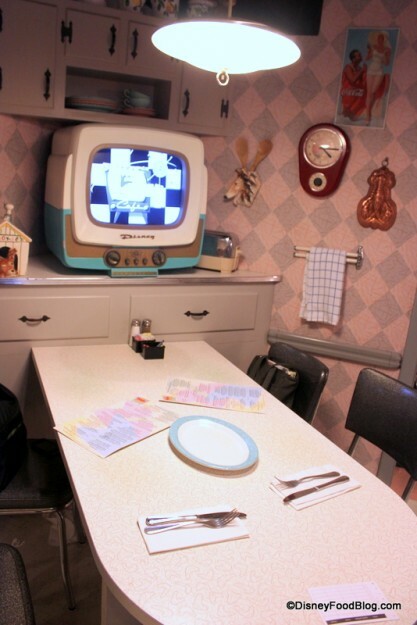 Plus, the genius of the Imagineers really shines at this restaurant; they’ve done an extraordinary job of re-creating the 1950s kitchen to a T.
What’s your favorite menu item at 50s Prime Time Cafe? Do you have a fun story to tell us about your visit? Let us know in the comments below! I really hope the next thing to be brought back is the fries with gravy! I used to order that for my entree back in the day! And the fish sandwich used to be awesome too. AJ, are the dessert viewfinders still in use? That herb and garlic cheese might be enough to make me skip sci fi dine in and eat here instead! Yum! I just made a ressie here for January. There will be 8 of us but I only made the ressie for 4…I cannot talk my introverted husband into eating here again (though he is all over WCC, go figure). Anyhoo, my mom and I love the wedge salad here so I made plans for a few of us to have a light lunch. She, too, will be thrilled that the cheese is back!!! On a side note, the citrus swirl has always been my favorite. I hope it stays! Yes!!! I had a feeling this is what you were hinting at on Twitter 🙂 This was/is my all time favorite Disney food! Thank goodness I have a reservation for Prime Time in 2 weeks! I was already looking forward to it, now I can’t wait!! However, having just read the new menu, I realise that it would definitely not appeal to me as not only have they taken away the pork loin that I had last year, (I could have picked something else though), but they have put garlic mash with everything – I absolutely cannot tolerate garlic, it makes me very ill if I eat it! Much as I love the atmosphere and cast member performances/interaction, I am glad now that we have switched to the sci-fi. It’s a funny thing, my wife and I should love this place and yet we have not eaten here in at least 15 years. We both grew up in suburban homes in the 50’s that looked just like the Prime Time. 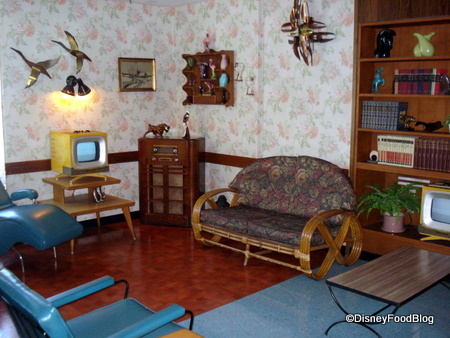 And I mean my parent’s house could have furnished that whole restaurant. Next, my picky eater spouse, will actually eat and enjoy most of these dishes. I think the problem, for us, is that the patter is repetitive and after hearing it a few times it seems forced. Even if you choose not to participate you are surrounded by it. I know most folks love to eat here and that’s great, but I cac cook most of these meals at home and I like to put my elbows on the table. I love the pot roast at 50’s Prime Time. Both times I’ve been there, that’s what I got and it is always tasty. 🙂 I wish I could’ve tried that fried cheese though! YUM! One of my favorites, love the fried chicken. The very first time we went years ago, had a boring cousin, but since then we have had nothing but fun. Mama Sue is the best, unfortunately she has not been working the last couple of times. The last time, when I was with my mom and sister we had a great cousin, whose name escapes me, but he remembered me from a vist many months prior with my kids! Have a rezzie for December and can’t wait. Taking a Disney newbie with us. Wo! Considering I had just mentioned a couple days ago in the Grand Floridian Café Breakfast review’s comments how much I missed the fried Boursin cheese, I’m now afraid of my powers. Really, that’s a good news, Mother still talks about it from our 2006 trip! They used to present it as “Fried Boursin cheese”, if I recall correctly, so I guess they do it in-house nowadays? Even better! As for the sampler plate, I had it on my birthday last year and it wasn’t dry, so let’s hope it was just a bad day in the kitchen. All Hail The Comeback Cheese! I don’t go to DHS often, but I will have to check this place out. It sounds awesome! favorite server experience: My then 6? yo dd had ordered chocolate shake with her meal – she’s NEVER met a chocolate shake she didn’t like – for whatever reason she REALLY didn’t like this one – and it was a hot thirsty-making day. When I sweetly admitted her aberration to Cousin Mikey and asked if she could have something else and we’d gladly pay an additional charge he questioned her as to her preferences. Being six, she had a little trouble deciding. I helped. A few moments later Mikey came back with a tray filled with every single drink option in the house all in lidded kiddie cups with straws, grumbling under his breath about indecisive children. She has never forgotten that – neither have we! what a great time this place is! 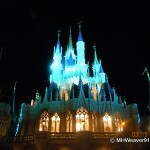 One of our must-do places every trip! 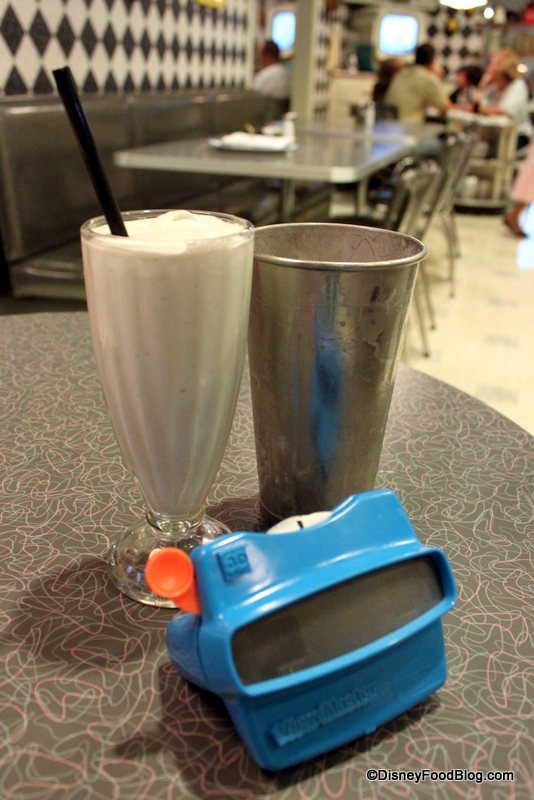 Regarding the viewmasters, they haven’t used them as the standard dessert menu for years. A couple years ago if you asked the right server you could still get one to look through. Not sure if they still have them there or not – I haven’t asked the last couple trips. Is the cheese being served at lunch also? I made reservations immediately after seeing this and I could only get in at lunch time. This is probably my favorite restaurant at Disney World because of the atmosphere. (Bluezoo is my favorite for food, if you were wondering.) If I could convince my wife to decorate our kitchen in a similar manner, I would do it in a heartbeat. For entrees here, my favorite is by far the fried chicken. The pot roast is pretty darned good, but the meatloaf I’ve always found to be way too dry. The one thing I really don’t like are the garlic mashed potatoes. They are too heavy on the garlic for my tastes. 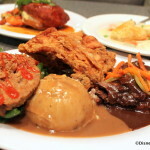 We love this place…the fried chicken and meatloaf is outstanding! In Feb 2011, we had one of the best “cousins” ever…and sadly I don’t remember his name 🙁 He was really into it though, and at one point referred to my Dad as “Scooter”…which floored us because that had actually always been his nickname. My aunt said “wow, how did you know his nickname was Scooter?” and the server, without missing a beat, looked at us like we were crazy and said “well, that’s what I’ve always called him.” And walked away…we all nearly choked from laughing so hard…it was great. And we still joke about a server we had in 2010 that picked up our cleaned plates and said “wow, first meal of the day?” We got stickers proclaiming us members of the “Clean Plate Club” that time…it was my BF’s celebratory meal after the WDW half marathon, so he was pretty hungry and had been waiting for that fried chicken for a whole year! We’re eating here again in Feb 2013 and I am sooooo looking forward to that fried cheese. Thanks for giving us something to look forward to and an incentive to train hard this season! 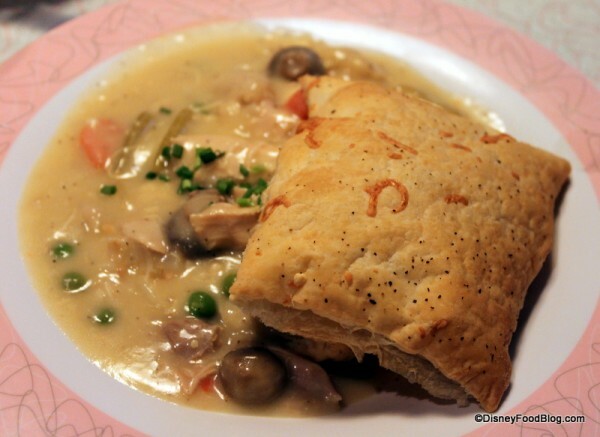 Anyone else a pot pie purist? Tasty as it may be, I always hate seeing a bowl of filling with a square of puff pastry placed on top called “pot pie”. We are eating here for the first time on our trip in December! S’mores?! Yes, please. I.Can’t.Wait. Oh man!! 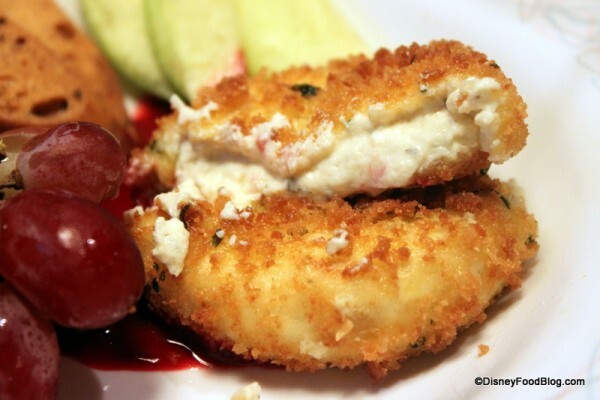 I had that fried cheese a couple nights ago and it was…AMAZING!! I also had the fried chicken which came out perfect. Not dry at all. I’m thinking you’re right about it being dry because you were there late. 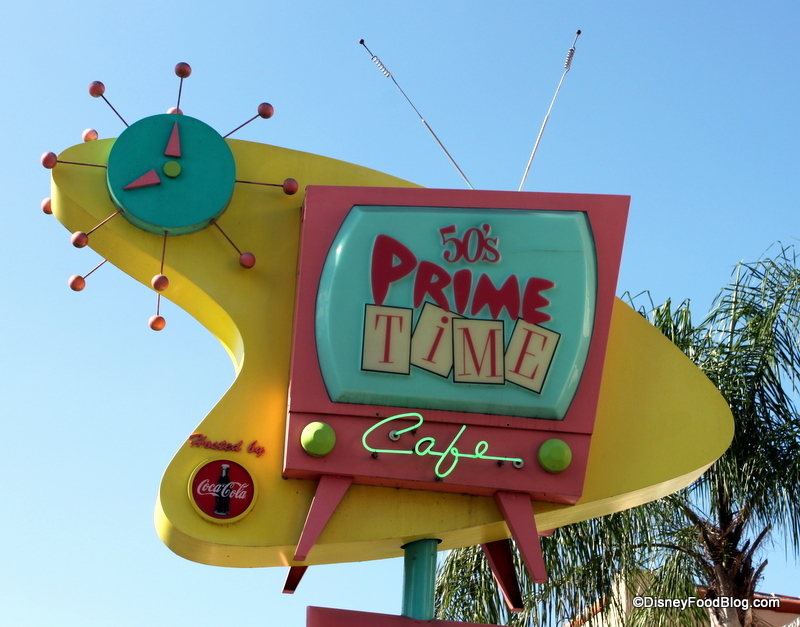 This was my first visit to 50’s Prime Time Cafe, it will not be my last! Just hope I get to return sooner rather than later(and they still have that cheese)!! I just ate here last Thursday, what a treat to be reminded of my vacation. I had the pot roast and just loved it. Wish I had seen that fried cheese on he menu! Next time! And they have the same menu at lunch and dinner, so yes, cheese at lunch. I’m LOVING hearing all of the fun stories you guys have!! This place really is a blast, I think. I can’t respond to all tonight (packing for an early flight tomorrow), but will get back to this post to respond soon!! Keep the reviews and comments coming! Desserts!! Smore’s is fun especially if you like chocolate but by far the Boston creme parfait it the best!! My husband would go here everyday for the fried chicken and a milkshakes alone. We would pick it 100x’s over the sci fi menu any day. We’ve gone here every year for the last 8 years at least once. Love IT!! 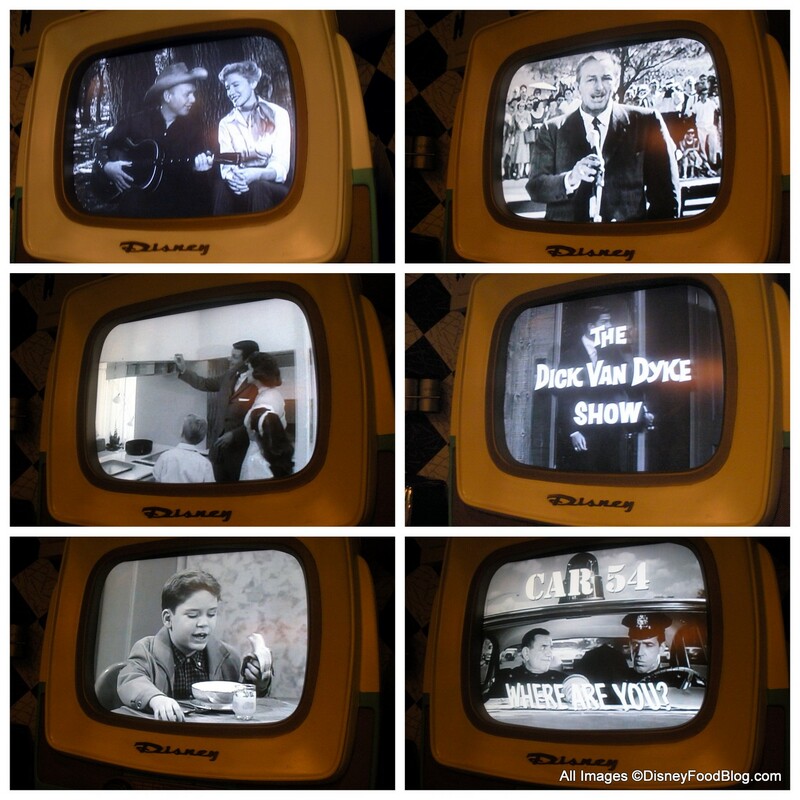 I LOVE this restaurant and usually visit every single time we go to DHS. I agree though, you will definitely know if it is an “off” night. I think out of the numerous times I have eaten there, only this last visit in July 2012 was one that I wasn’t totally impressed with. I’m a meat loaf girl and ALWAYS get it, but sub corn for green beans. My first experience at the restaurant and having the airplane done to me for not eating my green beans (I don’t care for green beans) taught me to ask for a substitution! It taught my kids to eat their veggies! One of the BEST waiters there was our waiter our very first time at the restaurant in 2002. His name is Anas (sp?) and he is still there! We saw him in July, but unfortunately, weren’t lucky enough to grab him for our waiter again. He made quite an impression on my now 18 and 20-year-olds! It was a VERY fun experience and we keep going back because of the fun and the food! Thanks for the review!!! 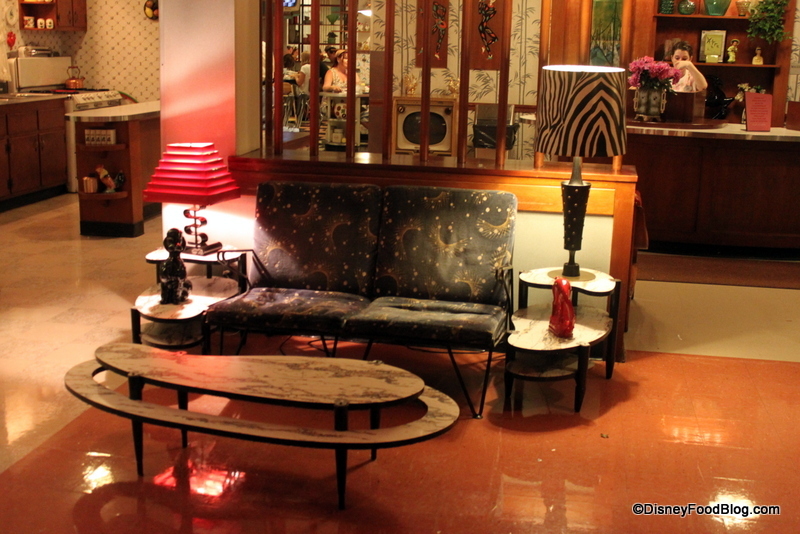 this is my favorite “atmosphere” place in the parks! i do agree that the meatloaf has changed there though. the first time i went after finding out i had to eat gluten-free, the chef assured me I could have anything off the menu except for the fried chicken and made me some of the most delicious meatloaf i’ve ever had. when we went back for my birthday two years later, i was discouraged from getting the gluten free meatloaf, which confused me since i assured them i had gotten it in the past and it was what i had made the reservation for. but they were right and i should have listened, it was inedible bad. i ended up having mashed potatoes and a pb&j shake for my birthday dinner. that said, i have to stop next time and find out if they can fry that cheese gluten free, since with those apple slices… mmmmmm. I’ve got a ressie here in Nov. and can’t wait! 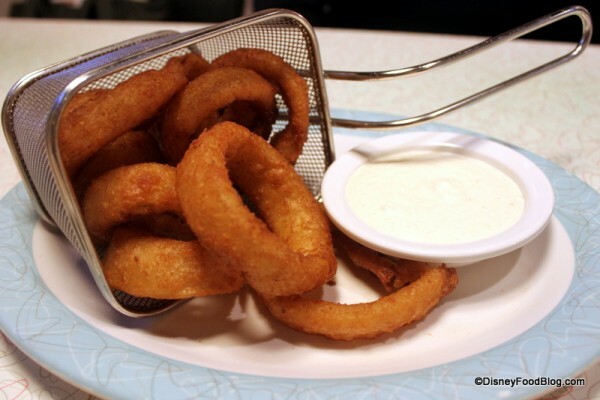 They seem to have changed the onion rings back again to a serving for two which I noticed as I’ll be solo. 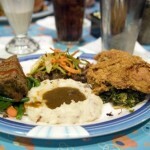 I love the fried chicken at the Plaza Inn in Disneyland and I hope it’s just as good here, mmm! 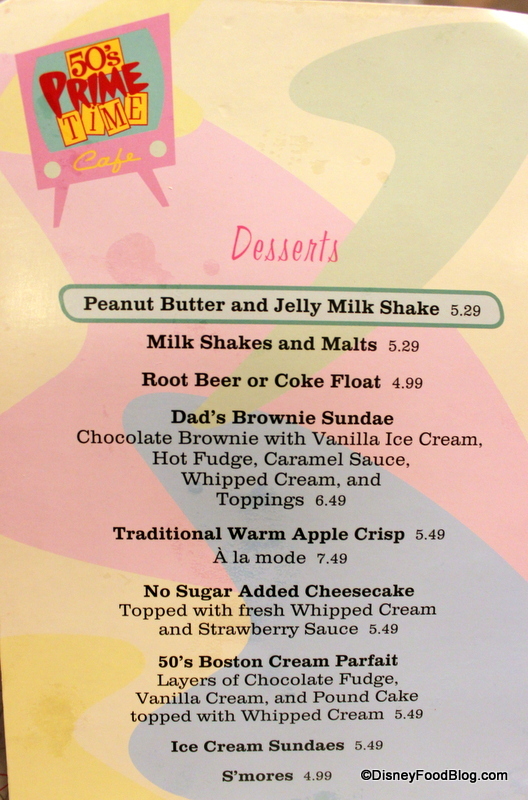 I have Ohana’s late the same evening after this early lunch otherwise I’d order the peanut butter and chocolate shake! I wish they had a take out window lol! Or can you order one at the bar?? :D!! Enquiring minds want to know! I bet you can! 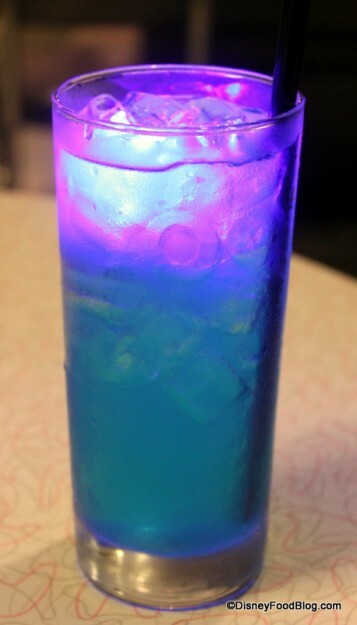 Kristina — Sure — you can order one at the bar! Being a somewhat frequent visitor to Prime Time, and, having spent 30 years in the Navy, I was reasonably confident I could complete my meal without getting into too much trouble. I had the meatloaf. When I was done, I used my roll to literally “wipe” my plate. (My dog couldn’t have licked the plate any cleaner). Our Cousin actually took my and walked it around the room, showing it to the “family of cousins from New Jersey”, and telling everyone, “THAT’S how you finish your meal”. I received a lot of awards while in the Navy, but the recognition from my Cousin was pinned a little closer to my heart. 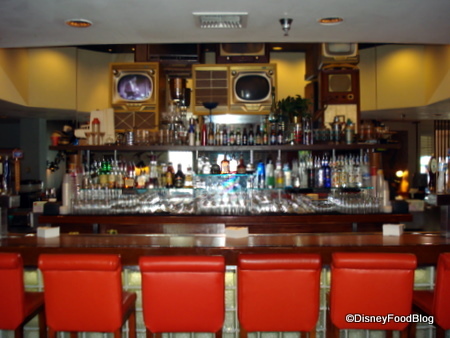 I kept meaning to come back to this page and tell you, but last year, my husband and I went to Disney World and I made a reservation for the 50’s diner. I got the cheese after reading this and it was absurdly good. If they didn’t take the plate away, we probably would’ve eaten that, too. Thank you for the recommendation! I’m planning this restaurant for out trip, but my son is worried about the manners thing. Thank you for letting me know we can request not to partisipate. I will prob just ask them to take it easy on him. I am dissapointed they don’t use the viewfinders anymore though. That is one oof the things that made me want to go. Also is the sampler considered a n.ormal meal for the dining plan? As any other Brasilian, way back in 93, Smores were new to me. I had just tried my first ones in a campfire in MI. my hostfamily took me there to try THE BEST SMORES EVER as they called it. needless to say it deserved the title. more than 20 years later, I still remember it. lookin forward to take my daughter there next year. Did they remove greens, as a side? I was told they did. 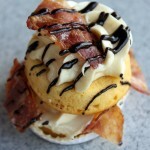 To me, that is a huge chunk of the yumminess! I over the years plate special and love my greens!